An almost blank canvas - but not for long! If you've followed this blog from the start you'll know that my darkroom sessions have been few and far between, much to my disappointment. I completed my darkroom last year but there was always so much clutter in it (it seemed to be used as a make-shift store room most of the time) that there was little encouragement for me to do some printing as so much had to be done to get the room into a usable condition. I have to admit that there was a lot of camera gear making the room untidy as well - along with a couple of my bikes and some bike parts. I tidied it up a couple of times but it wasn't long before the detritus made a re-appearance. 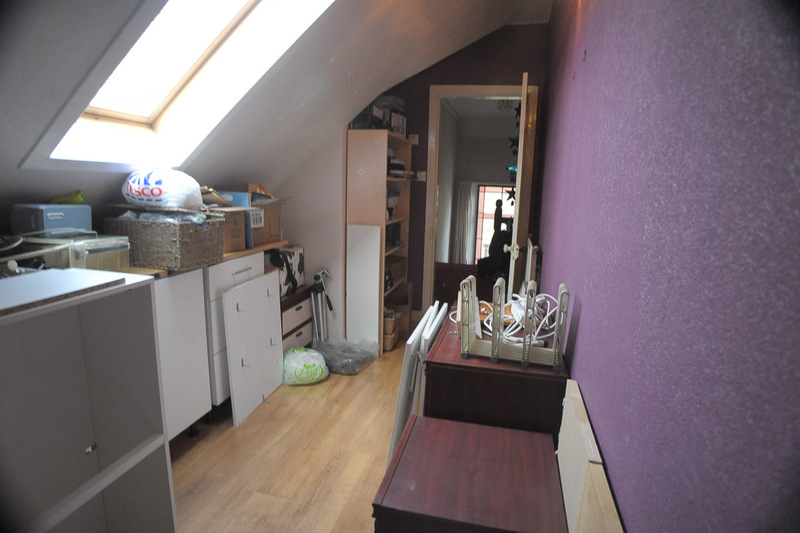 We don't have an untidy house but it's a Victorian villa and storage room is at a premium. That's why the darkroom was so convenient! And now, to add insult to injury, my daughter Freya decided she would ask her dad if she could move from her admittedly cramped bedroom into the darkroom. 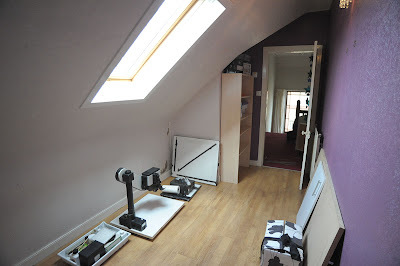 I don't think she knew quite what was involved but when I thought about it, it was very unfair that my darkroom should be bigger than her bedroom! Thus began the major project of moving all of Freya's stuff downstairs into the livingroom and all of my stuff upstairs into her bedroom. It ended up taking almost an entire day. 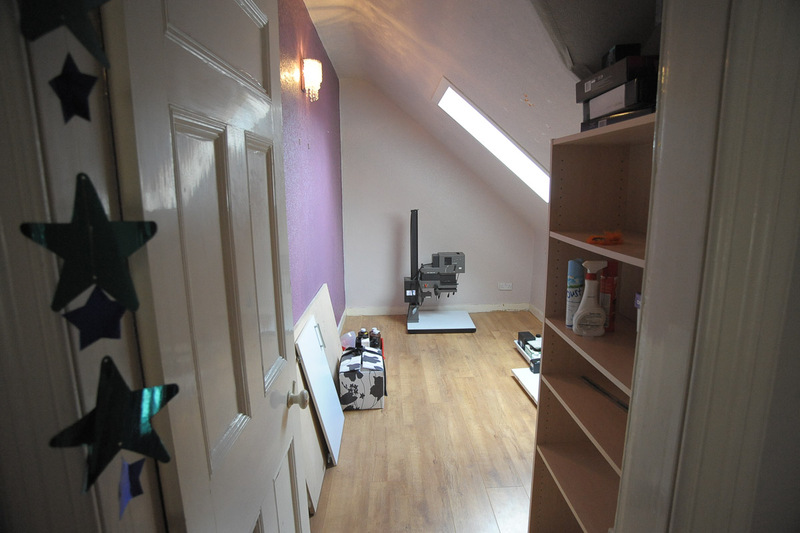 Freya's new bedroom now looks great (whether a 13-year-old can continue to keep it like that is another matter...) and, for a short time, the new darkroom looked quite tidy as well! The first pic shows the old bedroom after we'd evicted Freya but before I'd moved much of my stuff in. You can see the general layout. It's about 14 feet by 7 feet with a steeply sloping roof. I sketched a few layout ideas and decided that it will make sense to use the restricted height at the bottom of the slope for storage and fit the enlargers - a Durst Laborator L1200 and a Leitz V35 - along the left-hand wall as you look at the pic above. I did think of selling the V35 and siting the Durst on the far wall more or less where it's standing in the first picture but I've always wanted the Leitz and haven't really had much chance to use it - and my sketches showed that I should still be OK space-wise even with both enlargers in use. The reverse view. The effective working area is from the end of the bookcase nearest the camera back to the wall behind me. I have some kitchen units from the original darkroom and thought I'd line them up along the short wall and put my 600mm x 25mm thick MDF worktops on the top of them. The developing trays will go on top of this worktop. Inch-thick MDF is great for darkrooms as it's very stiff for stability but a lot cheaper and easier to work than normal laminated kitchen worktops. I gave some consideration to plumbing in a sink but decided against it. It wasn't particularly straightforward and there's a bathroom nearby. I'll put prints into an old print washer I have and sit that in the bath instead. The purple wall will take an enlarger at each end and a stretch of MDF board in between. Since the room is quite narrow, I'm not going to make the MDF board on this wall the usual 600mm but just 400mm to give me a bit more space to move around in the middle of the room. Here's the new darkroom as it's starting to fill up with stuff from my old one. I'm wondering at this stage if everything will fit! 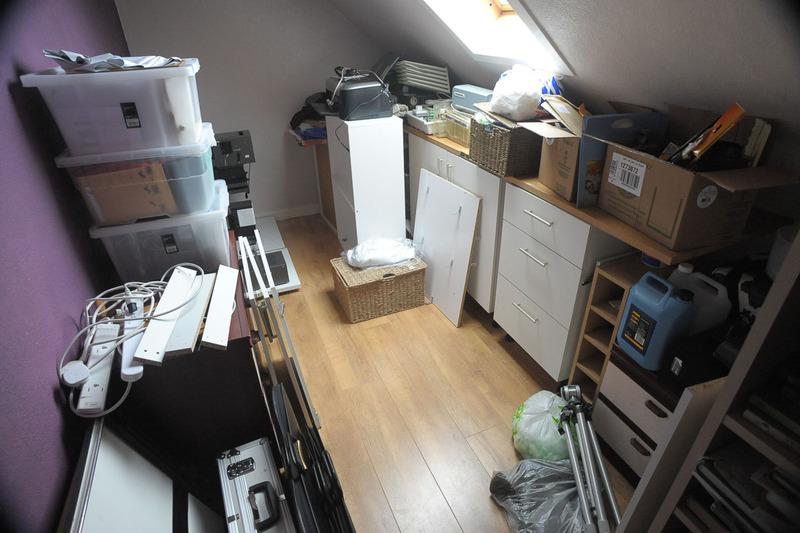 At it stands, the new darkroom is now about as cluttered as the old one but with the added complication that I've got to be able to work in it, install the kitchen units, worktops, etc. That will mean moving a lot of stuff out of the room onto the landing to give me some space. If you take a look at the photograph below, you'll see what I mean. 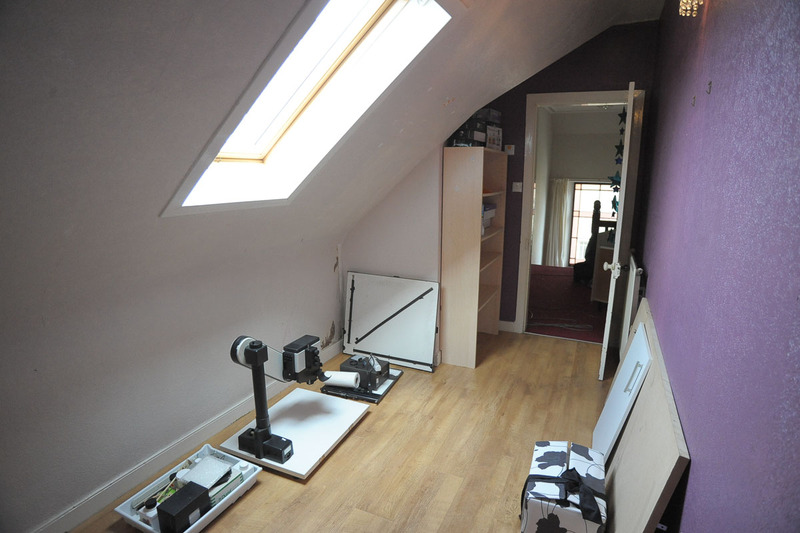 A 20mm lens probably makes the room more spacious than it actually is but it's still an excellent space for a darkroom. The units on the right are just standing there, unattached so to speak, with the MDF sitting on top. I was tempted to re-paint the walls as purple isn't exactly my favourite colour and I'm not a teenage girl but I can live with it and, to be honest, I couldn't be bothered! So that's where I am at the moment. There's a lot of work ahead of me but I'll hopefully be able to show some progress in Part Two. Good work! keep us posted! I'm about to sell my V35. Unsure if anyone near me in central Scotland will want one though. I've just set up a De vere 203 varicon and have no room for the Leica. Maybe if you offered it for sale on FADU you'd find a buyer. Or Edinburgh Photgraphic Society mght be worth a try. Thanks for that Bruce. I'll try FADU and EPS. I'm a member of Dunfermline Photographic Society but I think I'm the only member still using a darkroom, indeed still using film. I joined last year and was surprised no one else was using film, but then again maybe I shouldn't have been that surprised. If all else fails it's Ebay for the V35. It's a great enlarger. If you send me your email address Stefan I'll pass you the contact details of a Leica guy in Kinross. Don't know if he'll be in the market for a V35 but he might know someone who is. He's very active in the RPS.